Atlantis astronauts face anincreased risk of a deadly strike from space debris during their upcomingmission to repair the Hubble Space Telescope. But NASA has taken steps toreduce the risk from levels anticipated last year, despite the growth in spacejunk highlighted by February's collision of two satellites. The growingthreat that debris poses to astronauts and spacecraft was the subject of ahearing Tuesday before a U.S. House subcommittee. "It's not somethingthat you really need to lose sleep over, but it's something that we need to beproactive about and make sure that we do understand what the risks are,"Nick Johnson, NASA's chief scientist for space debris, told reportersbefore the hearing. In January 2007, China shot down one of its satellites during a ballistic missile test, creating a spike in debris more than 500 miles above Earth. This February, a commercial U.S. satellite collided with a defunct Russian satellite, creating a new debris cloud. "It's hard to believe that space has gotten that crowded," U.S. Rep Gabrielle Giffords of Arizona, who chairs the House subcommittee, said Tuesday. In March, residents on the International Space Station had to shelter in an escape craft after a late alert about approaching debris. The Hubble shuttle mission facesa 1-in-221 chance of a catastrophic debris hit. That's down from a 1-in-185probability forecastedlast fall, and comparable with the threat of a major failure by criticalshuttle systems like solid rocket boosters or main engines. By comparison, the debrisrisk during a mission to the International Space Station, which flies at alower and less congested altitude, averages about 1-in-300. NASA sets thesafety threshold at 1-in-200. Mission managers improvedthe odds for Atlantis by deciding to fly the spaceship as much as possible withits tail forward and payload bay facing the ground, LeRoy Cain, deputy shuttleprogram manager, said last week. In addition, Atlantis willdive to a lower altitude soon after letting go of the telescope near the end ofthe mission. "We take it seriously,and we think we're in a position that it's acceptable to go fly," saidCain. Atlantis is targeting a May11 launch. The astronauts visited Kennedy Space Center for training Tuesday. Johnson said NASA believesmore than 300,000 objects measuring at least half an inch in diameter now crowdlow Earth orbit. The Department of Defense'sSpace Surveillance Network officially tracks more than 19,000 larger objects,from about two inches to several feet in diameter, at altitudes up to about22,000 miles above the planet. Spacecraft shields canprotect against tiny particles. 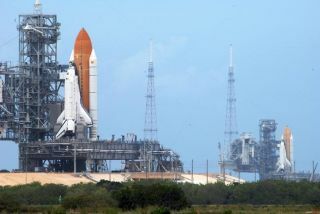 But objects as small as 5millimeters could penetrate a space shuttle's cabin and lead to loss ofpressure, Johnson said. The Hubble telescope itselfhas shown evidence during four past servicing missions of being "pummeledregularly," he said. Debris congestion hasworsened every year, as spent rocket stages and satellites accumulate,increasing the risk of collisions that worsen the problem. Efforts to limit the impactof space debris center primarily on not making the problem worse, Johnson said. A proposal to usehigh-powered lasers to clean up space junk has not proven practical, he said. The Department of Defenseplans to increase its tracking capability in an effort to give early collisionwarnings to owners of about 800 satellites that are capable of maneuvering outof the way. And nations are workingtogether to improve guidelines for limiting debris and sharing information thatcould help avoid collisions. "This is a bigenvironment, and the U.S. doing something by itself is not sufficient,"Johnson said. Published underlicense from FLORIDA TODAY. Copyright ? 2009 FLORIDA TODAY. Noportion of this material may be reproduced in any way without the writtenconsent of FLORIDA TODAY.